How do you make the perfect French Toast? Well, let me share my recipe with you because this is the BEST French Toast recipe and it’s so simple to make! 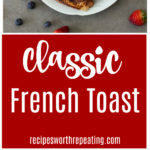 A simple classic, this French Toast recipe has a sugar and spice taste that is perfect for any breakfast or brunch! French Toast is Mr. Mason’s absolute favorite recipe. I don’t spoil him with this though…he only gets it only a couple times a year. He gets this yummy breakfast on Father’s Day, his birthday, and Easter. He recently asked me if it was hard to make my French Toast recipe and I was like…no way. Super simple and fast to make. So he asked me why I didn’t make it more often for him. And to be honest…I have no idea why I don’t make it more often for him. I totally should! It’s beyond easy, can be made ahead and frozen and it calls for basic ingredients. So I promised him I’d start making it more often for him and the littles. Texas Toast (if you are gluten free, read ahead. I talk about my gluten free bread of choice when making this recipe. Let’s go ahead and address the elephant in the room. 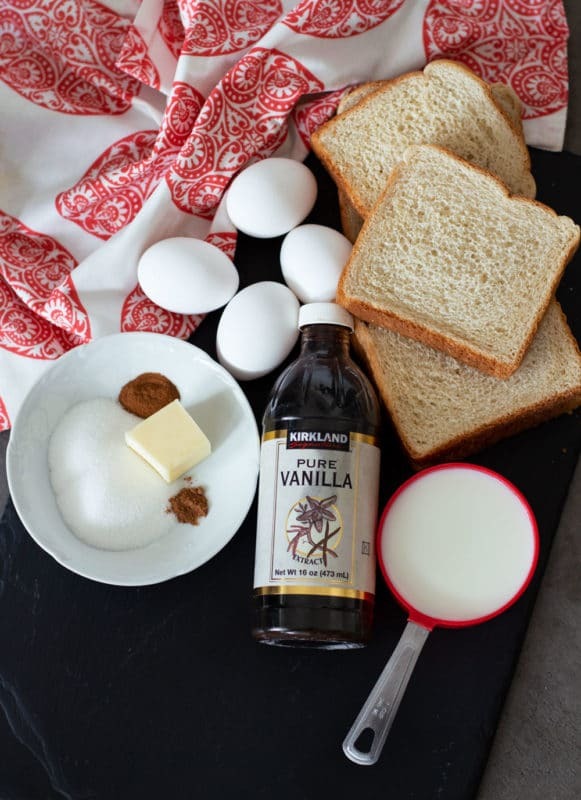 Yes – you can very easily make a gluten free version of this French Toast recipe. All you have to do is switch out regular Texas Toast bread with a gluten free loaf of bread. Now that all my gluten free followers are smiling, let’s talk about bread types and brands. I love using Texas Toast when making this recipe. My favorite brand of bread to use is Wonder Texas Toast. I also really like using Nature’s Own Perfectly Crafted White Bread. Both are available at your local grocery store and both brands cut their bread into thick slices, which is a MUST in my book for French Toast. You can use other types of bread though it you want. I know some people like to use sourdough bread when making this recipe. As for making a gluten free version of this recipe, I love using Rudis Gluten Free Bread. It can be found both in the freezer section as well as in the bread aisle at your local grocery. Rudis has 2 separate recipes for their gluten free bread. One needs to be frozen and the other can stay on your shelf. You can check out the differences and details here. I can tell you this…when I made a gluten free batch for myself, neither my kids nor my husband could tell the difference between my gluten free batch and my traditional batch. If they really stare at my batch they see that the slices of the gluten free bread is not cut as thick, but most of the time they don’t take the time to notice. They are so eager to eat it they could care less how thick the bread is. Why is French Toast called French Toast? Well, it didn’t originate in France. A man by the name of Joseph French invented French Toast. If you do your research, you’ll see that French Toast can be traced back to the Roman Empire. It was called “Pan Dulcis” and what the Romans do is soak bread in a milk and egg mixture and then fry it in oil or butter. Let me walk you step-by-step on how easy it is to make this recipe. First, slice your bread into 3 columns so you have “sticks”. When making this recipe, I use the entire loaf of bread and you’ll want to do the same. I’ll tell you why below so keep reading. Take the eggs, milk, sugar, cinnamon, nutmeg, vanilla extract, and beat together until well mixed. Note that the cinnamon and nutmeg hang out at the top of the mixture after you mix. This is perfectly ok.
Next, you’re ready fire up your skillet and melt the butter. Take a piece of bread and dip it into the egg mixture. You’ll soak each piece for about 3-4 seconds until it’s slightly saturated. Place each piece in the skillet where the butter has melted. Let each piece saute for about 4-5 minutes and then flip. Your bread should look like this when flipped over. If you don’t have that golden brown glow on each piece, you flipped them over too soon. Once you turn your toast over, cook until the other side is browned. Repeat with remaining bread slices. Once you’ve cooked all the pieces, you’re ready to add your toppings and dive in to eat! Once all the bread slices are browned, place them on a cookie sheet and place in the oven for 10 minutes. The goal is to get these slightly crisp. This is what makes this recipe so good! Can you freeze French Toast? Yes! When I mentioned above about using the entire loaf of bread, it’s because I freeze what we don’t finish eating. I typically take 3-4 sticks of the cooked french bread and place them in a sandwich baggie. On school days, I pull out a couple of baggies and bake them in the oven at 350 for 10-12 minutes. It’s the perfect breakfast for the kids before they head to school! If you’re making a gluten free version of this recipe, you’ll follow the exact same steps as I listed above. This recipe is not finicky when using a gluten free bread. I love topping my French Toast with fresh strawberries, blueberries, syrup and powdered sugar. Looking For Other Breakfast Recipes? If you loved this recipe, give this recipe a star review! Also, snap a picture of your finished dish and share it with me on Instagram using the hashtag #recipesworthrepeating and tagging me @recipesworthrepeating. How do you make the perfect French Toast? 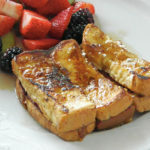 Well, let me share my recipe with you because this is the BEST French Toast! A simple classic, this French Toast contains just enough cinnamon and nutmeg and is perfect for any breakfast or brunch! In a small and shallow bowl, beat together eggs, milk, sugar, vanilla, cinnamon, nutmeg. Cut your slices of Texas Toast so you have 3 columns. Dip bread slices quickly on both sides. You want to ensure both sides are covered, but not soaked. In a skillet, melt your 2 tablespoons of butter over medium heat. Add half the bread slices and cook until the first side is lightly browned. Turn over and cook until the other side is browned. Repeat with remaining bread slices. Remove and add butter and syrup. You are ready to eat! Update Notes: This post was originally published in June of 2017, but was re-published with updated step-by-step instructions, pictures and tips in April of 2019. You will find affiliate links on this page. Do you know how hard it is to prepare food for your family where you and one of your children can only eat certain things due to food allergies, but the other 2 people in your family can eat anything they want?? Hi…and welcome to my life!! It’s ok though…I have this figured out. By the way…I’m Amanda! I’m the creator, writer, "cooker" (as my son calls me) and amateur photographer of Recipes Worth Repeating! You’re going to love my recipes because I cater to both needs. My recipes can be made gluten-free, as well as traditional! Yes! You do have the option for both! My Grandson and I made this on today and we loved it thanks Yummly. Yeah! So glad you loved this recipe! My husband asks me to make this all the time but he always gets it for Father’s Day and his birthday! Glad you loved it!!! Had this tonight for dinner. It was a hit. Easily doubled it for our family of six. Nicely done. Don’t you just love breakfast for dinner?!? So glad you loved it! Thanks for the feedback!! I can not wait for Father’s Day! French Toast is my fav! 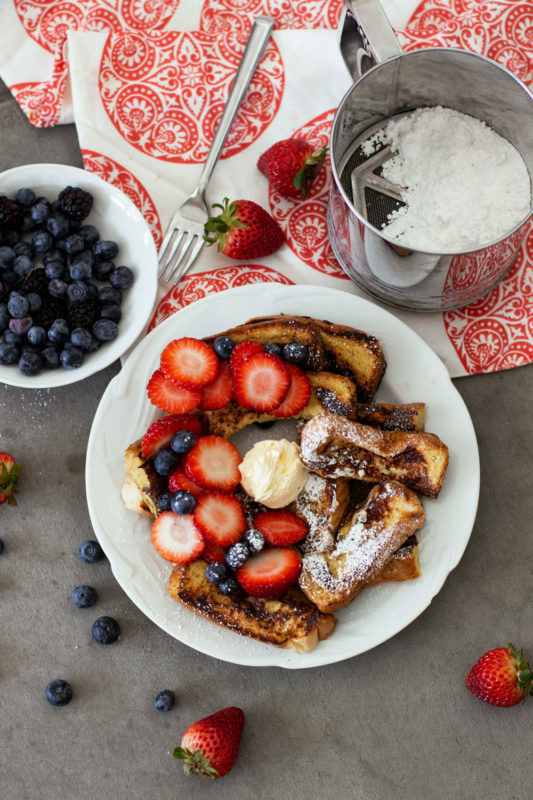 I loves me some French Toast and this looks great!. I also have a 35 year old sweet sourdough that has totally brought our french toast game to the next level. That sounds yummy!! I’d love to try my recipe with your sourdough bread! YUM!! Looks delicious! 🙂 I will pin this. I found your link on the Totally Terrific Tuesday Link Party. Thanks! I hope you enjoy!! I’m SO glad you loved it! Thanks for your comment! Looks yummy I think I need some french toast! I haven’t had any in a long time.Thank you for sharing on Merry Monday! Hope to see ya next week! Thanks! I hope you get a chance to try it! Hope you are having a great week and thanks so much for sharing your awesome post with us at Full Plate Thursday! Get all our latest recipes straight to your inbox!